The policies of Poland’s ruling ‘Law and Justice’ party, over the last two years, have thrown up one protest movement after another across the country. While largely maintaining its base of support among section of the working class due to a number of popular social reforms, the government’s reactionary and Bonapartist measures keep antagonizing layers of the urban middle class and increasingly the youth. In July, the parliament passed a new justice system bill, which intended to bend the Justice Minister’s will to the courts of justice, as well as the High Tribunal. This sparked a protest movement that resulted in Poland’s President vetoing parts of the bill, even though he was elected on Law and Justice ticket. Jarosław Kaczyński’s Law and Justice party, with its populist and nationalistic rhetoric, was elected to power two years ago on a wave of working class bitter disappointment and anger after two decades of neoliberal capitalism in Poland, introduced after the collapse of the ‘People’s Republic of Poland’ Stalinist regime. The new Law and Justice government introduced expected social reforms, like child benefit, an hourly minimal wage and promised to lower the retirement age. At the same time, the peripheral and dependent character of Polish capitalism saw Law and Justice present itself as dealing with the historical task of developing an independent Polish capitalism. This task, the party believes, justifies the need to subjugate elements of Poland’s state apparatus, justice system etc., which puts into question the bourgeois notion of the ‘rule of law’. In 2016 parliament sacked judges from the constitutional court (appointed by the previous neoliberal ‘Civic Platform’ government) and replaced them with Law and Justice appointees. Regardless of the constitutional squabbles over these firings, the country was polarized by this issue. Anti-government protests erupted, giving birth to a ‘Committee of Defense of Democracy’ (KOD). However the working class, especially its organized sections, had no trust in this movement, seeing it as an attempt by neoliberal politicians to get back in the game. The KOD mobilized almost exclusively amongst middle aged, middle class people. Few youth were seen on the streets even during the largest of the protests. Eventually the KOD lost momentum and its leadership collapsed amidst squabbles and embezzlement scandals. The situation changed, however, after an attempted repeal on abortion rights. Conservative pressure groups succeed in making the total ban on abortion discussed by the government and Law and Justice’s leading politicians. Widescale opposition poured onto the streets, with massive demonstrations of predominantly young women. Many new people got involved in struggle and the abortion ban bill was dropped. Last July parliament passed a bill on justice reform that aimed to purge the National Council of Judges and the High Tribunal, and replace them with judges approved by Law and Justice’s’ justice minister. It also included other administrative measures, like introducing ‘justice inspectors’. These policies seemed attractive to a section of the population that regard the law courts as corrupt, ineffective and undemocratic bodies that have nothing to do with justice. Indeed, unlike pro-capitalist liberals, we know that capitalist courts are, broadly speaking, a reflection of a state apparatus acting accordingly to the needs of the capitalist system. The movement against the justice reform, unlike the previous KOD protests, attracted youth that were worried about the prospect of authoritarian rule. Some of the very first demonstrations were organized by the left, like the joint protest of the Razem party and OPZZ trade union federation, together with other left groups. As the movement started growing, voices from the liberals urged the left to join the capitalist parties in a common front to “save democracy”. At the same time they pressured the left not to raise any criticism of capitalist partners (therefore neither the current defunct system). This was unfortunately accepted by Razem. At the very first opportunity, the capitalist politicians muzzled the left, not allowing representatives from the left to speak during a mass rally. Liberal politicians – in reality only a little less conservative than ‘Law and Justice’ – on several occasions struggled to curb the youthful and more left elements of the movement, for example by banning or limiting the presence of LGBT flags during rallies. These events opened up a discussion, particularly among Razem activists, some women’s’ rights groups or left intellectuals on how to fight a more tenacious fight, and not have democratic demands buried under neoliberal leaders agenda. After a week of daily protests and mobilizations, the President Duda vetoed two of three justice reform bills; the purge of the Council and the Tribunal was dropped, while some administrative changes remained (still leaving Law and Justice to insert some more attacks). This was a surprise to many, since President Duda is largely seen as Kaczynski’s ‘rubber stamp’. It remains an open question whether the veto was Duda’s attempt at independence, a political ruse or an early sign of cracks in the ruling party. In wider society, the veto was seen as a victory or rather a good compromise and the movement dispersed. During the last breaths of the movement, part of the left wanted more independence from the liberals. 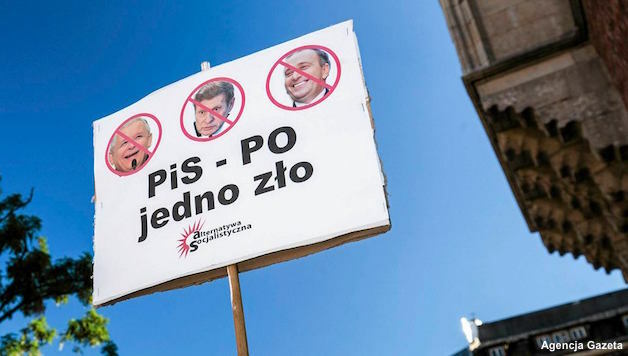 A Razem party branch in Krakow called for a demonstration calling for democratic rights, women’s rights, the environment, LGBT issues and so on. Alternatywa Socjalistyczna took part in the coalition organizing the demonstration. During the rally we explained that the strength of the Law and Justice government was due to the years of neoliberal capitalist rule of its predecessors. We said that today’s neoliberal ‘defenders of democracy’ only yesterday took away abortion rights, argued against the right to organize trade unions and ruined entire communities with their economic policies. We called for an independent left struggle for democratic rights, by which we mean not the defense of capitalist courts but struggle for women rights, union rights, against nationalist attacks and against the government control of the media. Our speech and slogans on the rally were widely circulated online, sparking a debate in progressive ranks. The strong position we expressed led to some sympathy from the left regarding our “tenacity” but also to hysterical condemnations and attacks from liberal circles interested only in maintaining the status quo. The regional KOD stormed away from the rally and later that day issued a statement against our involvement in the movement. In turn this led to two articles about Alternatywa Socjalistyczna published in Poland’s biggest liberal newspaper, ‘Gazeta Wyborcza’ (one report in a local edition and a second (full of slanders) in the national edition). The attention given to our ideas allowed us highlight our demands. There will be movements to come – new attacks on women’s rights are looming, and education will be subjected to reactionary learning programmes. Resistance will arise but clearly a ‘pro-democratic’ movement led by the architects of capitalist misery, oblivious to the real reasons for the gains of the nationalist and populist forces, cannot attract the working class. The Left and workers’ movement should lead these battles but also lead the working class out of the deadlock between reactionaries and neoliberals, by presenting a socialist way forward. To paraphrase a US slogan about Donald Trump; ‘Law and Justice’ is a symptom, capitalism is the illness and socialism is the cure’.